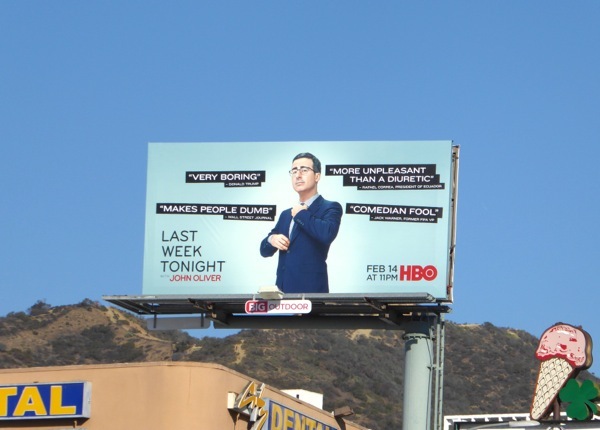 Last Week Tonight with John Oliver is back by popular demand this coming Sunday, despite what some people may say. 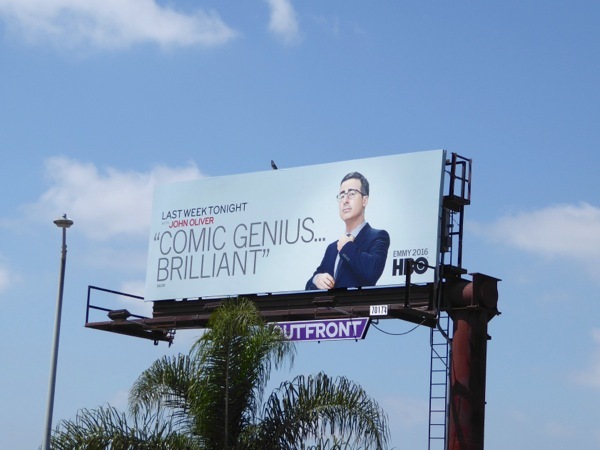 Returning for a third season on HBO, the Emmy-winning British comic has plenty of cannon fodder from the world of news, politics and current affairs from around the globe to put his own unique satirical spin on for his weekly late-night show. 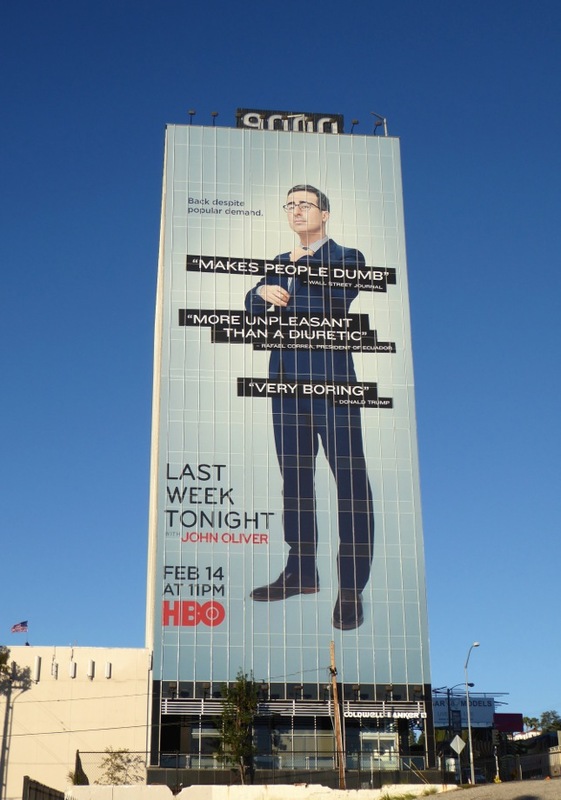 Let's face it, this "comedian fool" is in good company if Donald Trump finds him "very boring", especially after the reality star Republican Presidential candidate found President Obama's 2016 State of the Union address similarly boring. 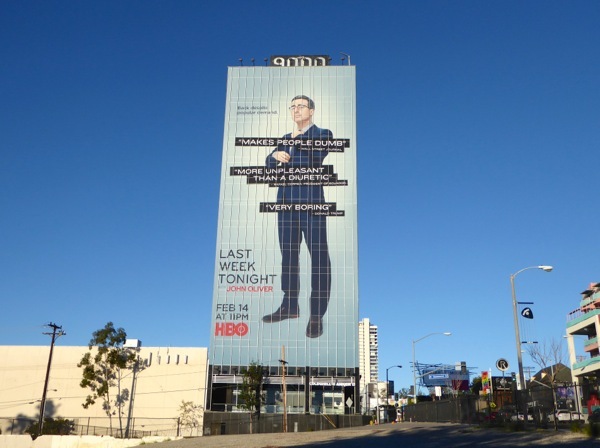 These season three Last Week Tonight billboards were first spied along L.A.'s 3rd Street, Melrose Avenue and La Brea Avenue on January 21, whilst the giant-sized John Oliver was snapped towering over westbound traffic along the Sunset Strip on February 1, 2016. 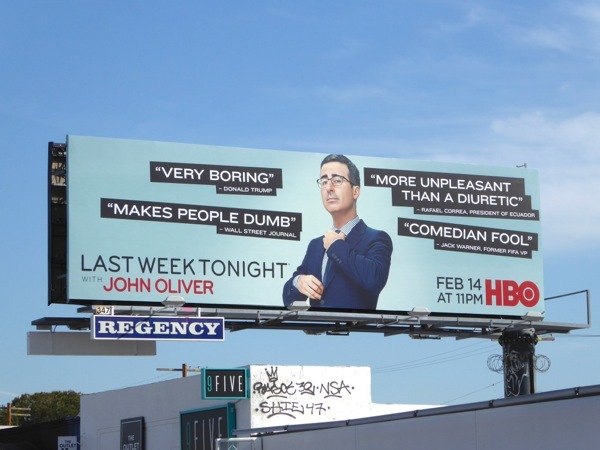 If you're a fan of the show that "makes people dumb", you should also check out these Last Week Tonight season one billboards and season two billboards from the skies of L.A. in recent years. 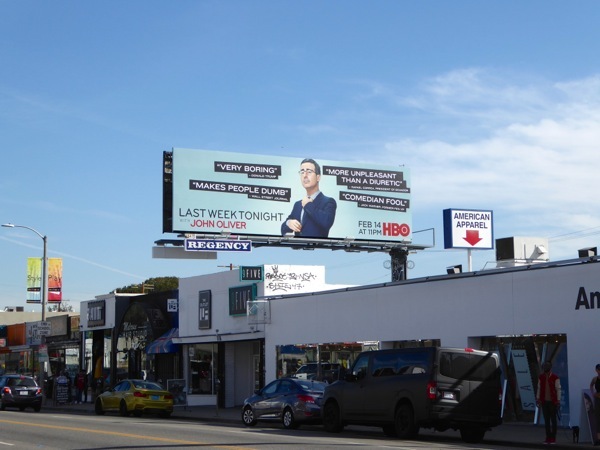 For more late-night talk show competition, be sure to also check out these fun billboards for The Late Show with Stephen Colbert, these Full Frontal with Samantha Bee billboards and these Real Time with Bill Maher billboards to name but a few. 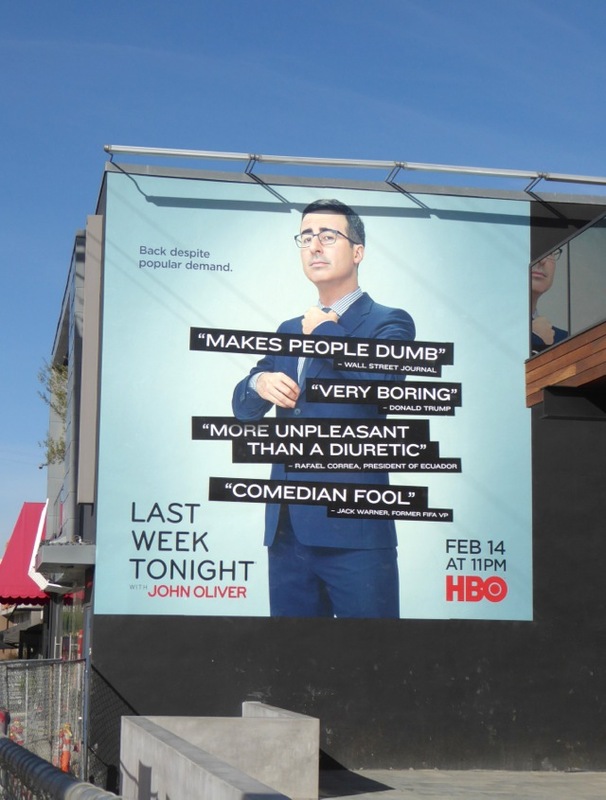 As John Oliver's third season debut will take place on Valentine's Day, maybe he will win over all his detractors and make them fall in love with him again, or maybe they're all just lost causes and he should just concentrate of informing and entertaining his thousands of other fans. 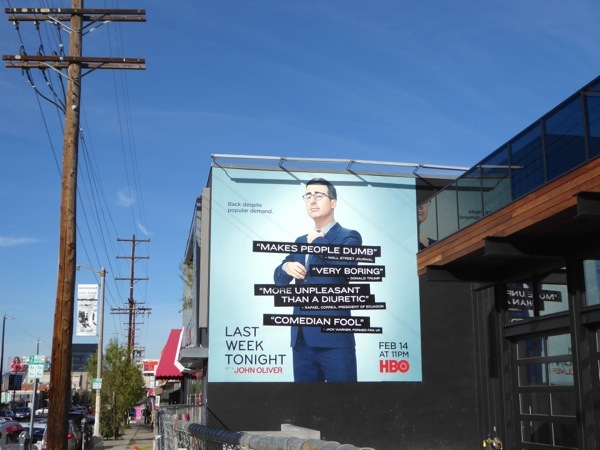 UPDATED: Here's also the Emmy consideration billboard for the 'comic genius and brilliant' third season of John Oliver's show, snapped along Sunset Boulevard in West Hollywood on May 26, 2016. 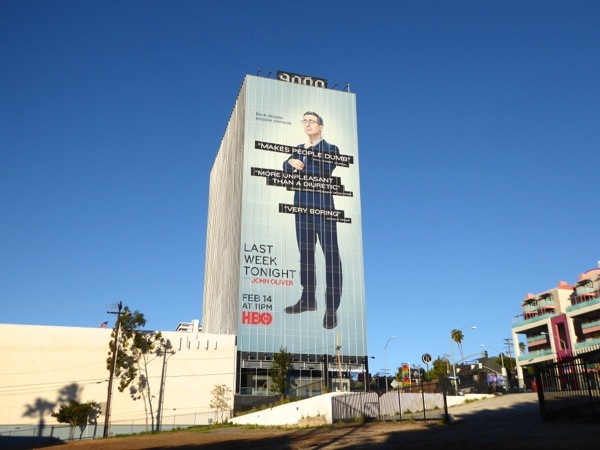 I'm curious to know whether you remember the whereabouts of the vinyl poster in the third picture. I'd love to hear from you!